I have been a long time follower of the work of Ruth Tabancay and though have never actually met we have been in a number of exhibits with one another & had a fair amount of personal correspondence. So when she submitted her newest work to my most recent curatorial endeavor, small stories currently on view in NYC, I was so excited. Ruth is most know for her innovative works using tea bags as her material but in her newest works she is delving into the realm of embroidery. All of Ruth’s work is incredibly powerful and with this new body of work I felt it was the perfect time for us to get to know her and her work a little bit better. Where do you live? Does this affect your life as an artist? I live in Berkeley, California, not far from California College of the Arts. If I hadn’t been able to fit classes there into my family’s busy schedule, I doubt that I would be making art today. What is your background/education as an artist? After 12 years working in private practice pediatrics, I left my job to be more available for my 3 daughters and found I had time for classes at California College of Arts and Crafts, as it was known then. Going part-time on the 9-year plan, I finally earned a BFA in Textiles. I should backtrack a bit and acknowledge all the years I studied bacteriology and medicine. I’ve always been fascinated by anything I could see through a microscope and had a huge Aha! moment when I put art and science together. 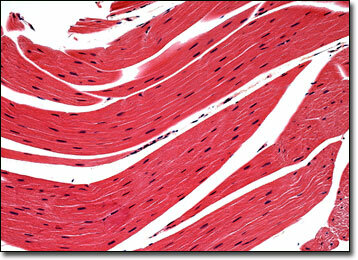 Ikat weaving looked like striated muscle. Stitched tea bags reminded me of squamous epithilium. Random weave baskets were a replica of collagen fibers. And once I examined my artwork, I realized that everything I had made was somehow a reproduction of human tissue or micro-organisms I had seen through a microscope. Without being aware of it, I was developing a visual vocabulary long before I even thought about being an artist. Can you give us a 4 sentence or less artist statement of your current body of work? I’m fascinated with tea bags because of the many layers of information they hold for me. With meanings of physical warmth, intimacy, recycling, and biology, I have used them to express several different concepts. In another body of work I use vintage linens that in the past were embroidered with decorative images like flowers or baby animals. I give these textiles an authentic history by embroidering them with images of what actually touched their surfaces. How did you come to making your new embroidery project “what linens know” ? what inspired it? A class assignment at UW asked us to use time as a concept so I thought of juxtaposing something from long ago with the present. I considered the modern-day technology that my daughters now use and also the dresses they wore when young. It seemed awkward and not very interesting to decorate clothing with high-tech objects but I thought I could stitch images of them onto a garment. I found a 50’s-style child’s dress at a thrift store and stitched outline pictures of things my daughters currently play with, a CD, laptop, cell phone, iPod. Intrigued with the possibilities, I looked for more old textiles to embroider and found stacks of vintage linens at an antique store. Almost all were decorated with flowers, birds, or fanciful objects like smiling teapots. I wanted to give these linens their own history so I embroidered images of things that would have come into contact with the fabric, a tea cup ring on a coaster, chicken bones hidden in a napkin, flower petals and pollen fallen onto a table runner, blood on a handkerchief. How does working with embroidery affect the conceptual aspect of your work? My earliest memories of my mother involve her doing some kind of needlework, embroidery, tatting, crochet, knitting. With embroidery I feel a kinship to her and all the women who spent many hours stitching to decorate their homes. But instead of embellishing, I use embroidery to convey something about the vintage linens themselves. You work with tea bags a lot can you talk about what it is about these objects that inspire you and what they conceptually add to your work? The idea for making the first tea bag quilt occurred when my teenage daughter and I were snuggled under a comforter, drinking cups of tea and working on her geometry homework. As tea bags accumulated on the windowsill, it seemed that stitching them into a quilt was the precise way to isolate that treasured moment. Dried tea bags mean warmth and intimacy for me but also, once I had finished stitching them, I realized that the confluent surface was reminiscent of human epithelial cells as seen under a microscope. Also, I have a tendency to want to extend the life of almost everything that comes into my house so tea bags speak to me from several directions. Are there specific issues that come with working with tea bags as a material? Tea bag paper tearing while I’m stitching can be a problem with some brands more fragile than others. The more the work is handled, the more likely that some tea bags will tear. I accept that I’ll have to do some repairs whenever my tea bag bed returns from a show if just can’t be helped. About 4 years ago I started brushing poly vinyl acetate (PVA) on the tea bags in some of my art pieces and that seems to strengthen the paper. Avid tea drinkers at a weaving school, several friends, and my family take the time to save and dry tea bags for me. For work like the tea bag bed, I start in the middle of the piece, placing tea bags together edge to edge on a muslin base, then hand-stitch them together onto the muslin until the surface is completely covered. For the quilts made of painted round the tea bags, I first coat them with PVA (poly vinyl acetate) before painting with acrylic paint. With a pencil I draw a hexagon grid directly on the muslin base and use the painted tea bags to plan the layout. I label each hexagon with its color, then spray a light coat of spray adhesive on the muslin to hold the tea bags in place while I stitch. For both types of quilts, the completed tea bag surface is layered with batting and backing, hand-stitched all around the edges, then tied together. For my embroidered pieces, I draw objects like chicken bones or flower petals on tracing paper, or make an actual water or wine glass ring on a scrap cloth, transfer the image with a water-erasable pen onto the vintage linen using a light box, then stitch the image. Pollen was the most fun! dozens of French knots with single-strand of embroidery floss. Representational drawing. Once I started to embroider, I knew I needed to make my own images but have always struggled with drawing. I know that the more I practice, the easier it will get. Early on, my work was subconsciously inspired by microscope images. That evolved to purposefully using microscopy to create formal elements. For one series of work I used a scanning electron microscope to photograph different textiles at a very high magnification, then wove those images with the computerized Jacquard loom. It was literally a weaving of a weaving. Since completing the Fiber Arts Program at UW, I’ve started to explore other concepts like the What Linens Know series. I continue to use tea bags but am playing with other ways of using them besides stitching. I’m interested in work that uses large numbers of similar objects. My first new piece along those lines is “Twice the Size of Texas,”a 10 X 19 installation made of hundreds of pieces cut from plastic bags. It’s a representation of the Great Pacific Garbage Patch, the mass of plastic floating in the Pacific Ocean that by one estimate is thought to cover an area twice the size of Texas. A big influence for me is my former fiber sculpture professor from CCA, Carole Beadle. Assignments such as “take one material and make as many things as you can from it” and “make art from something you use every day” were so useful in getting me to think like an artist. In critiques, her question, “what are you trying to say?” was invaluable in helping me to make my strongest work as a student and I rely on it now. Also, I’m inspired by the work of artists who use large numbers of similar objects to create work that is conceptually integrated with the individual units. Of those artists, the one whose work stands out the most is that of Ghanaian artist, El Anatsui. His monumental pieces are made from great quantities of liquor bottle tops stitched together with copper wire. Not only are they stunningly beautiful, the fact that they are made from materials gleaned from his environment to create a cloth that references the traditional kente cloth of his culture as well as a historical link between Africa and Europe makes them conceptually very strong works. 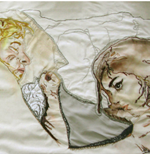 And since I’m relatively new to embroidery, I look to the work of many skilled contemporary embroidery artists. One in particular is Lauren DiCioccio. Her realistic embroideries of mass-produced objects are so masterfully rendered one has to look at them twice. Knowing that level of technical skill is possible inspires me to refine my own technique. My work is included in several group shows this summer. Currently my work is in the show you (that’s me, Joetta) juried, small stories, at Urban Alchemist Design Collective in Brooklyn and at Home is Where the Needle Marks at Pop Tart Gallery in Los Angeles. Later this summer I have work that will be exhibited in Latitude at the Handweavers Guild of America’s Convergence® in Long Beach, CA and at Fiber Options in Annapolis, MD. In the Fall my work will be shown at New Fibers at Eastern Michigan University. Thanks so much to Ruth for taking the time to share about her work. I loved learning about her background and realizing how new she is to art making am SO excited to see what comes next for her.